One day, Balaramji stayed at home, and Shri Krishna went with the cows and the cowherd boys, to a particular spot on the bank of the Yamuna. A serpent called Kaliya lived in the Yamuna at that spot, and his venom had poisoned the water there. Due to the intensely warm weather, the cows and the youths were all very thirsty. They ignored the danger, drinking deeply to quench their thirst. The poison was so strong that they died on the spot. However, Shri Krishna revived them all, showering them with elixir just by His divine look. Sri Krishna then decided that since Yamunaji  the daughter of the Sun  was His sweetheart, His darling, and was later on to become His fourth principal Queen at Dwarka, He would throw out the Kaliya nag from inside her waters. Shri Vallabhacharyaji Maharaj says that our senses are like the Kaliya nag, and when we indulge indiscriminately with the 'vishayas' (sensual objects), it is like imbuing 'vish' (poison). So, the Lord Shri Krishna jumped into the waters of the Yamuna, with the purpose of purifying the sense organs of His devotees, absorbing the poison as Shankarji had done, and removing the Kaliya nag from there. Kaliya nag was fast asleep. His wives  the nagins - saw Shri Krishna, and asked, "How did you come here? Go away quickly! Our husband is extremely venomous!" 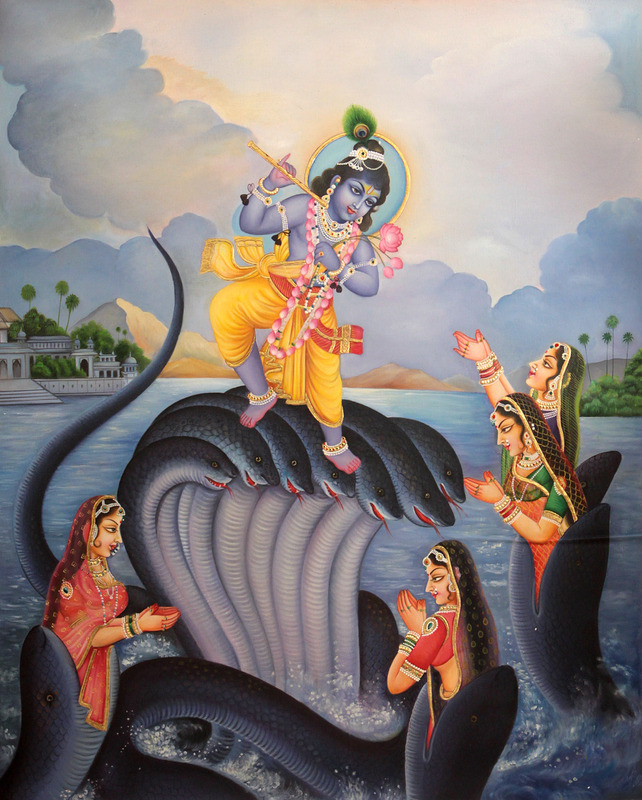 Shri Krishna said, "Let him be as venomous as he wants," and kicked the sleeping serpent, calling out a challenge. The serpent woke up hissing with anger. When his eyes fell on Shri Krishna, however, he was enchanted. "I have never before, in my life, forgiven anyone," he told the Lord. "However, I am bewitched by your beauty. So  if you desire your own good, leave me quickly. Shri Krishna said, "Oh, Kaliya  I did not come here to simply turn back! The purpose of my coming here is to make you go away. I you agree, you can leave this river immediately. If not, we will fight it out." Shri Krishna and Kaliya nag then began to wrestle. Kaliya caught Shri Krishna tightly in his coils and gave Him such a bite, that or a moment, the Lord became immobile. All the people in Vraja were horrified to see this. They began to weep and lament. 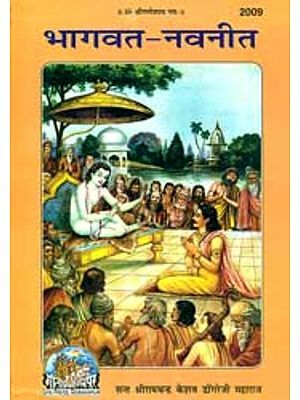 Balaramji, however, knew the power of the Lord. He managed to convince everybody that there was no cause for fear. "Parikshit, the Lord Danced such a tandav on the heads of Kaliya nag, that His feet tore the serpent's hoods to shreds. The serpent's body was crushed. He began to vomit blood. Then he thought of God, and mentally surrendered to Him." Seeing this, the wives of Kaliya nag began to eulogize the Lord with an amazing hymn of praise. They said, "Lord, You have punished our husband  this is not your justice, it is Your Grace! Because, even great ascetics are unable to obtain the touch of Your feet. Our husband is guilty. We have no idea as to what austerities he may have performed in the past, to obtain Your Grace in this way." The Lord was pleased, and jumped down from Kaliya's head. The serpent regained consciousness, and said, "Shri Krishna, whether You control me, or Grace me; whether you punish me, or show mercy  I will say what is in my mind. Please tell me, is it not You who created the world?" "Yes," replied the Lord, "I have created the world." "Is it not You, who became the world"
"It is I who have become the world." "Are you not its abhinnanimittopaadan karana (material and instrumental cause)?" "All that is in this world  the jaati, aakriti, svabhaav, all the good and the bad tendencies, all the strength, ability and power  is it not all created by You?" It is not You, who made me a serpent?" "It is, indeed, I who made you a serpent." "It is not You, who put venom in my tooth?" "Then, what is new, about what I do? If it pleases You, then uplift me; or leave me, but You have to admit that You are responsible for all that has happened here." This argument left Shri Krishna with nothing more to say. He said, "You came to this spot, because you feared Garudaji. However, I now plan to frolic here, so it is not suitable for you to remain here. I have placed my foot on you head. As a result, you are now liberated. You need fear Garudaji no more and can safely return to your original home." Even the snake is a creature of the Kingdom of the Lord. Hence, even snakes have their uses, and deserve a place to live, and food to eat. Answering Parikshit's question as to the cause of the quarrel between the Garuda and Kaliya nag, Shri Shukadevji Maharaj said, "Kaliya nag had, on one occasion, refused to give his portion of the routine sacrifice given to Garuda. So. Garudaji was annoyed with him. At first, Kaliya nag fought with Garudaji, but when he lost, he went and hid in the Yamuna. Garudaji did not come to the Kaliya daha, because Saubhari Rishi had cursed Garudaji, saying that he would die if he came to this spot. It was most inappropriate of Saubhari Rishi to curse the mount of the Lord in this way. As a result, he got entangled in sensual pleasures. And, although Garudaji did not come to the Kaliya daha, the Lord came, and purified the spot. When Shri Krishna emerged from the water, after subduing Kaliya, he was embraced lovingly by all the people. His father, Nandababa, gave lots of offerings to the Brahmins and mother Yashoda Maiya Looked as though life had been restored to her. 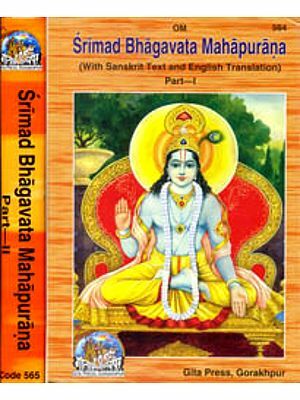 An Episode from the Devi Bhagavata?